At Focus Learning we believe CAMP should be a time for FUN! We also know that these school breaks can be an AWESOME opportunity for kids to develop new interests and skills. If you’re looking for inspiring STEM education, this is the right place for you!! Each camp program is specialized to meet your child’s needs. Focus Learning aims to create an experience for kids that empowers them to be healthy, active creators who will discover their inner talents and curiosities while learning and playing this summer. How can I choose from your two locations? • Campers 6-12 years old should come to our North York Site at Leslie and York Mills, inside TopKids School, where FocusKids programs are provided. • Campers 12-15 years old should come to our Markham Site at Steeles and Don Mills, on the upper level of the Shops on Steeles and 404. • Both camp locations are less than a five-minute walk away from public parks. • Both camp locations are easily accessible by TTC or YRT bus routes. What makes Focus Learning different from other camps? • Focus Learning camp programs are designed and delivered by a team of certified educators and industry experts. • We keep the teacher-student ratio at 1:8 or lower to ensure quality and safety. What are the qualifications of your camp instructors and counsellors? • All of our program teachers are either OCT or TESL certified or experts in their field with relevant certification. • All of our counsellors are university students or graduates who have had previous summer camp counselling experience. • All of our instructors and counsellors are CPR and First-Aid certified and have gone through Vulnerable Sector screening. How do you guarantee the safety of the campers? • There is a live security camera in each classroom to help us monitor and track the classes and activities. • CPR, First-Aid, and Vulnerable Sector police background checks are required of everyone working at Focus Learning. Should my child bring lunches and snacks to camp? • Campers attending the North York Focus Learning Kids camp will have the option to order their lunch as part of their package. Otherwise, campers will be expected to bring their own nut-free lunches with two snacks. 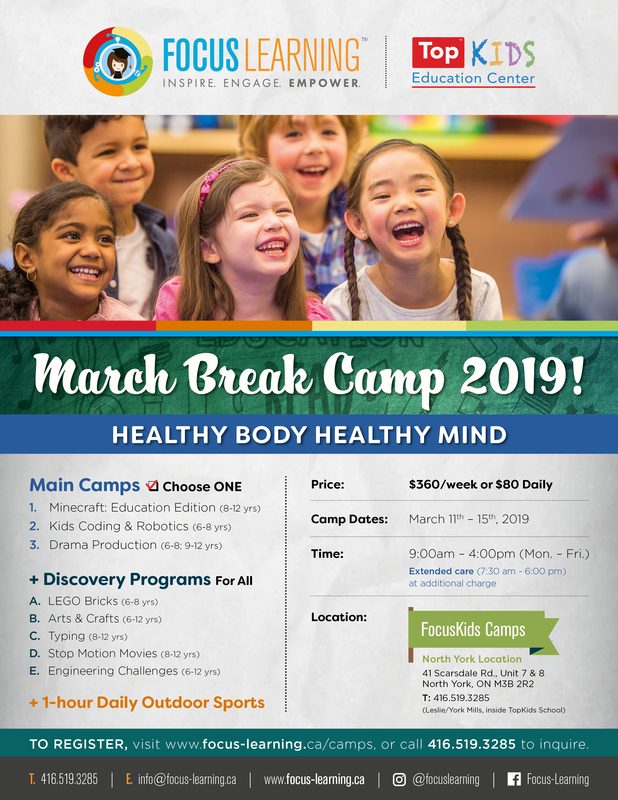 • Campers attending the Markham Focus Learning Intensive camp can bring their own nut-free lunch or can use their lunch break to get food from the surrounding restaurants. How can I get a tour of your camp locations? • Tours of both locations can be arranged by contacting us via telephone or e-mail. • Children may not be permitted to attend camp until or unless full payment has been received or processed. • 80% of the camp fee will be refunded on cancellations received 10 or more business days prior to the start of the camp session. Refunds will only be honored on full camp payments. • 50% of the camp fee will be refunded on cancellations received less than 10 business days prior to the start of the camp session. Refunds will only be honored on full camp payments. • No refunds will be issued on or after the first day of camp. In extreme cases such as sick leave or emergencies, camp fees can be kept as credit for future camps until August 31st, 2020. • Cancellation notice must be submitted in writing. • Focus Learning reserves the right to cancel a camp with insufficient number of campers and will offer a full refund as a result. At least 2-week notice will be provided.